IKEA, the world’s leading home furnishings retailer, today announced it is submitting plans to the City of Grand Prairie, Texas for the Swedish company’s second Dallas-Fort Worth-area store and fourth in the state. 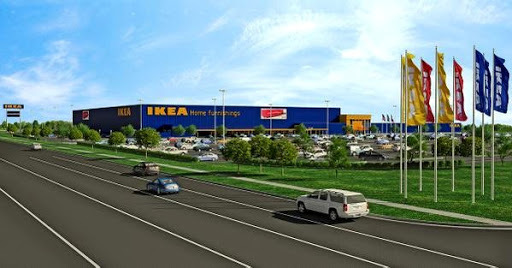 Pending approvals, construction of IKEA Grand Prairie could begin Summer 2016, with an opening in Fall 2017. IKEA Grand Prairie and its 1,250 parking spaces would be built on 32 acres along the eastern side of State Highway 161 and Mayfield Road, north of Interstate-20. Store plans reflect the same unique architectural design for which IKEA stores are known worldwide. IKEA also will evaluate potential on-site power generation to complement its current U.S. renewable energy presence at nearly 90% of its U.S. locations. IKEA Grand Prairie would feature nearly 10,000 exclusively designed items, 50 inspirational room-settings, three model home interiors, a supervised children’s play area, and a 350-seat restaurant serving Swedish specialties such as meatballs with lingonberries and salmon plates, as well as American dishes. Other family-friendly features include a ‘Children’s IKEA’ area in the Showroom, baby care rooms, play areas throughout the store, and preferred parking. In addition to the more than 500 jobs that are expected to be created during the construction phase, more than 300 coworkers would join the IKEA family when the new store opens. IKEA Grand Prairie also would provide significant annual sales and property tax revenue for local governments and schools. Drawing from its Swedish heritage and respect of nature, IKEA strives to minimize its operations’ carbon emissions because reducing its environmental impact makes good business sense. IKEA evaluates locations regularly for conservation opportunities, integrates innovative materials into product design, works to maintain sustainable resources, and flat-packs goods for efficient distribution. U.S. sustainable efforts include: recycling waste material; incorporating key measures into buildings with energy-efficient HVAC and lighting systems, recycled construction materials, warehouse skylights, and water-conserving restrooms; and operationally, eliminating plastic bags from the check-out process, phasing-out the sale of incandescent light bulbs, facilitating recycling compact fluorescent bulbs, and sells only LED bulbs. IKEA U.S. has installed electric vehicle charging stations at 13 locations, has solar arrays at 90% of its locations, and owns two wind farms in the U.S.